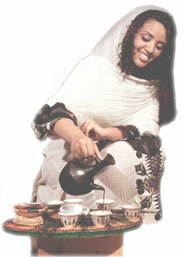 The perfect cup of coffee from the birth place of coffee, brewed for healing and not as a drug. Our coffee service is in the Ethiopian tradition of coffee ceremony, designed for decompression, relaxation, and healing by replacing evil spirits with good ones. St. Yared Ethiopian Cuisine's catering service is a great way to celebrate and honor the many big and small events in our lives. Birthdays, holidays, reunions, anniversaries, weddings, coporate & private meetings and parties, luncheons and much more. Whatever your next event may be, St. Yared Cuisine is pleased to be a part of your plan. 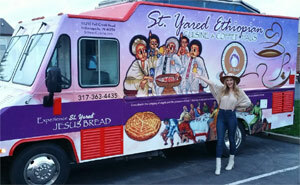 St. Yared Ethiopian Cuisine has made it in the Top 10 Places to Eat in the Midwest by Yelp. A taste of the "Hidden Empire", developed over an ion of time, founded in an ancient civilization and culture, and guided by the spiritual blessings of some of the world's major religions; a cacophony of taste not only to the mouth but to all the senses! What we serve is an experience in timeless adventure. Our service is guided by the spiritual belief of the great Ethiopian people that the guest in the house or the stranger at the front door must be received with open arms, fed, served and comforted for that guest or stranger may be Jesus Christ. When you come to join us for coffee, dinner, we would like you to know that you are for us a special person and not another customer. Best Arabica beans roasted with an extraordinary reverence and technical mastery available for sale. Great selections, wines, spirits, beers and other beverages designed to complement the dining adventure. Join us for dinner or stop by for brunch during the weekend, and experience your very own Ethiopian adventure in timeless culinary tastes and cooking.